This is an awkward one to do a layout for because there seems to be so many schematics out there that the best one is always going to be a matter of personal preference. The original used one half of the opamp for the effect, and the other half for the bypass buffer, with a transistor buffer at the beginning and end of the circuit. This layout is based on the GGG schematic which has an input buffer only and because the layout is designed for use with a 3PDT true bypass switch it ignores the bypass buffering and so only uses one half of the opamp. Both should fit comfortably in a 1590B. Many people have reported good results without the output buffer, and so it may be worth trying the most simple option first to see if you're happy with it. There are so many ways you could do this. Omit both transistors and use one half of the opamp as the input buffer with no output buffer. Have a transistor input buffer and the unused side of the opamp being used as an output buffer etc etc. The possibilities are endless. Possible mods that have been suggested, if you find the effect muddy then consider swapping the 22u and 47u caps for 220n and 470n respectively (some people believe the 47u is definitely wrong and was actually .47u and just misread). It may be worth socketing those caps so you can experiment. Some people have reported that the 220p cap should in fact be 1n, but others have said it sounds better with that cap omitted entirely, so again it may be worth socketing so you can swap and remove to test. 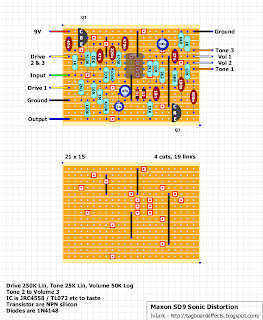 Suggested improvements to the tone control is to swap the 27n cap for 33n, and swap the 100n cap connected to Tone 1 to 47n. Socket and see. So I've built the output bufferless version, and I'm currently effectless. It passes signal fine, and the LED lights up, but when engaged I get nothing. I've checked and double checked.. Can't find anything.. I'm using a 2n4401, is that the issue? your 100µf electrolytic is in backwards. and your bottom 47µf may be backwards also. derp derp. Looks Like I'm not very good at this. lol. Thanks for the help nicholas! no prob! just keep at it. after a few it comes really easily. second nature, even. OK! so i have it passing signal now, but it sounds quite, fuzzy? and harsh. Has a considerable amount of gain with the poot at 0 (though I think that's the same with the original) and the volume and tone pots don't do a thing..
make sure you go back and look at every solder joint. you might have rows touching. the joint on the jumper that connects the 9v to the opamp looks particularly cold. perhaps it isnt grounded properly? 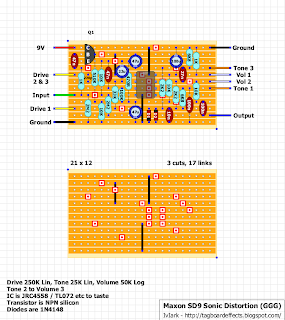 the board, a lug on the switch (depending on the switch wiring diagram you used) and the dc jack ground all have to link together in some way. empty lugs??? 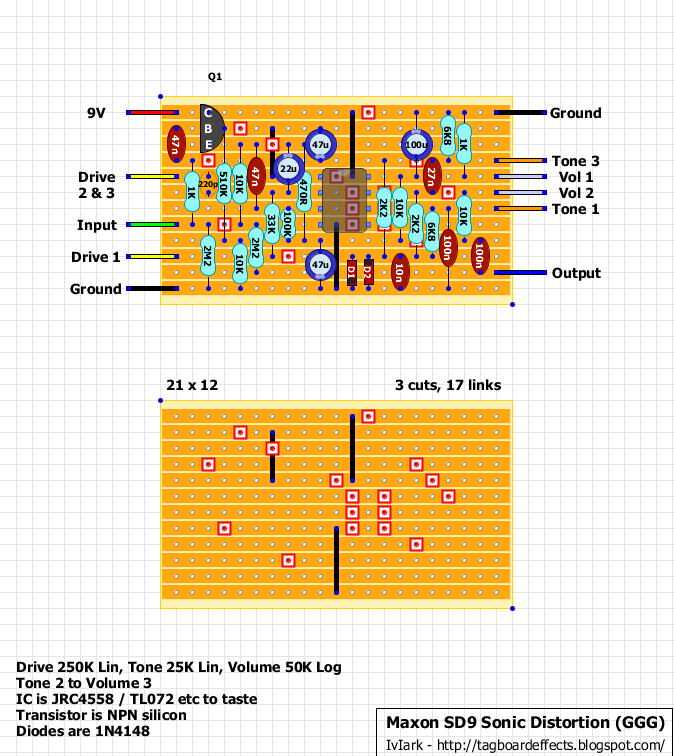 on the tone and volume pots?? it says on the bottom of the layout that they're supposed to connect. that's probably the issue right there. Nicholas, if we ever meet, You get a huge hug. And you get to slap me. oh awesome, does it work?? Yessir! went with 2 LED clipping until I get my germs from smallbear, the ones I got locally were not working. which transistor do I have to use for this one? BC546, BC547, BC548, BC549, BC550. Or if you rotate 180 degrees 2N3904, 2N5088, 2N5089 etc. They're just unity gain buffers and shouldn't affect the sound in any significant way. Anyone ever replaced the Maxon switch with a TB 3PDT switch? I can follow 4 to 5 wires but I'm not sure about 2 wires (gray and white/red)? I think grey and white/red are board out and board in. My take on the bufferless one! Excellent. That surprised me mate, a lot more gain than I have always expected from an SD9. Does the switch swap the input cap or something else? If i'm not mistaken (was some time since i made this one) i just put the stock clipping on there along with yellow led's in down position and non in middle ofc! And for adjustments in mods in values I can't really remember what i put in of the above mentioned alternations, think I went with the 220pf at least... wish i made notes on the values :( Might have a photo of the board somewhere but i guess you won't be able to read the values from the caps and so on. 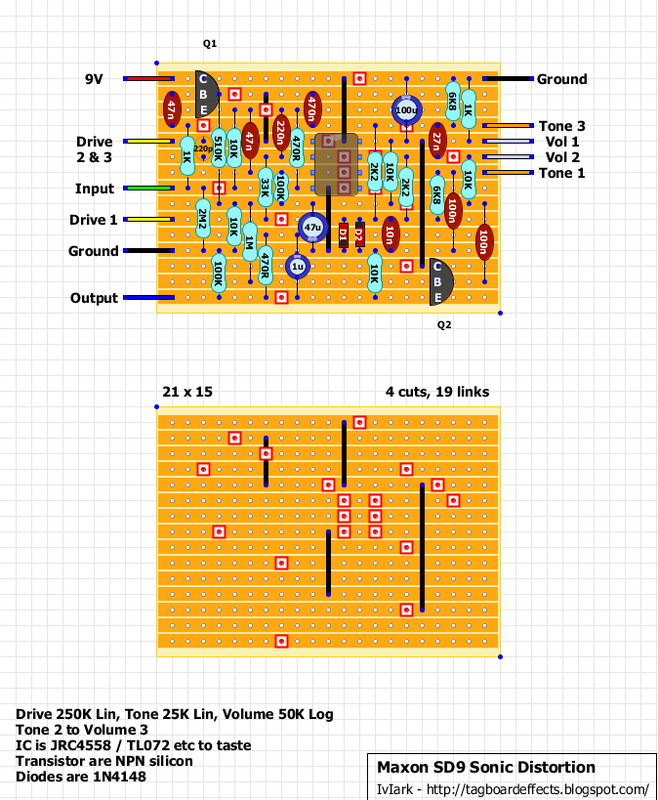 I'm building the one with both input and output buffers, and I only have electrolytics for the 100nf caps. Which way should they face? I built version with buffer. Works great!!! I notice that tone control is way more useful than in original one. Is that normal in this layout? Hey all! Big fan of what you guys are doing. I own a Analogman modified SD-9. I really dig how there's no loss of bass response with this pedal. But the tone knob bothers me. Seems to be muddy or super thrill. What's your advice for making the tone knob more useable over the whole sweep without changing the characteristics of the gain structure?